St. George’s Cathedral (previously called Christ Church) was built to designs by Sir James Pennethorne in 1836 and consecrated on 13th July 1837 by Bishop Blomfield. It was Later altered and decorated in 1867 by William Butterfield. 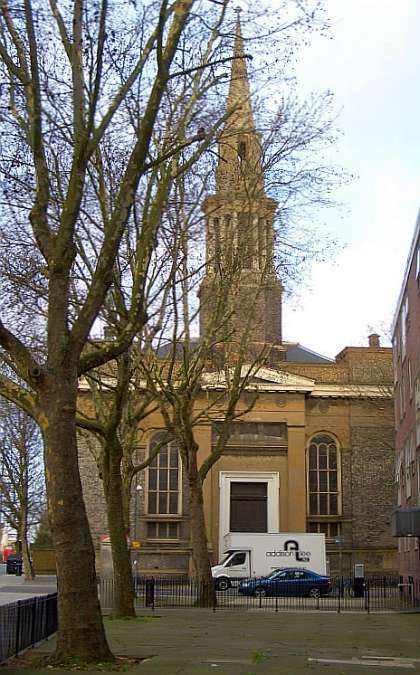 The proposal for a new church came from a group of laymen who felt that more church accommodation was needed in the Parish of St. Pancras, and the site was given by the Crown Commissioners who owned most of the land in and around Regent’s Park. It was the first church to benefit from Bishop Blomfield’s Metropolitan Churches Fund, and received £1000 from it. The cost was about £10,000. The building stands at the north corner of Redhill Street with Albany Street. It is a rather late example of the classical churches favoured in the early nineteenth century. It is built of yellow brick into which is introduced a considerable amount of stucco and some stone. Its treatment is classical, in one order, the four angles being marked by massive tower-like features, with a slight projection from the main face. It occupies a very large scale, with an impressively weighty exterior emphasised by large square pavilions at each angle and by the prominent cornice which surrounds the parapet. Rising above the parapet is a brick tower of three stages covered by a steeple. The first stage is of brick with projections on each face; the next has twelve columns and entablature following the plan below with two columns to each face and one at each angle; the third stage is octagonal with a clock face towards the cardinal points beneath an arched opening flanked by pilasters that by their projection leave the diagonal faces recessed. Above this is the thin spire with rolls up the angels. Unlike most of the building, this is of stone not brick or stucco. 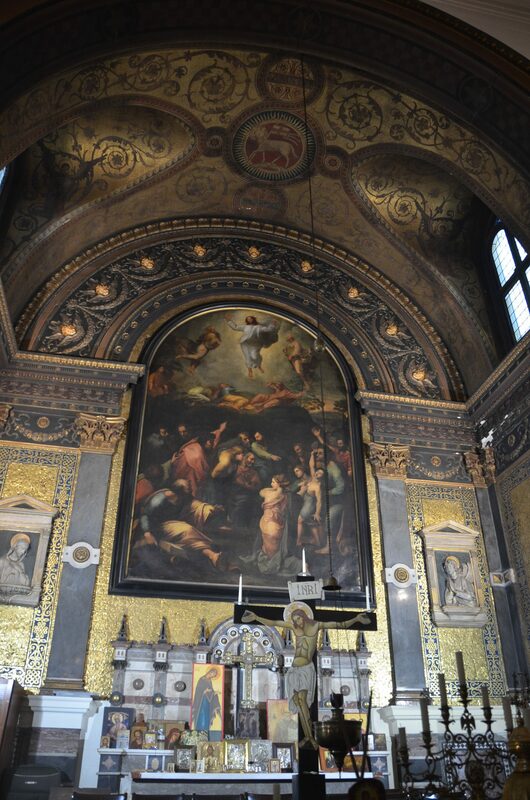 The Altar is lined with red marble and mosaic on six square stone balusters and has a large round-headed reredos or retable of The Transfiguration, a nineteenth century copy by Thomas Brigstock of the painting by Raffael. 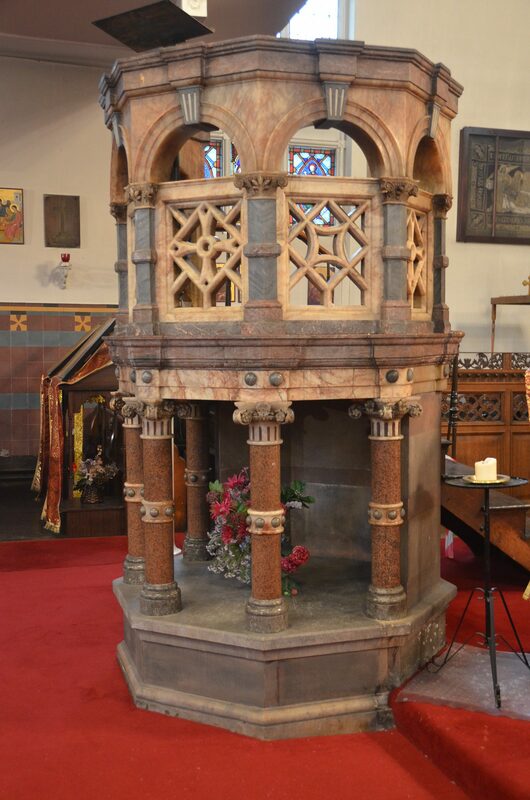 The Pulpit is by Butterfield, a large octagon of various coloured marbles in an Italianate style set on a base of pink granite pillars, the upper part has open arches with grey keystones. The sculpture is by Earp. 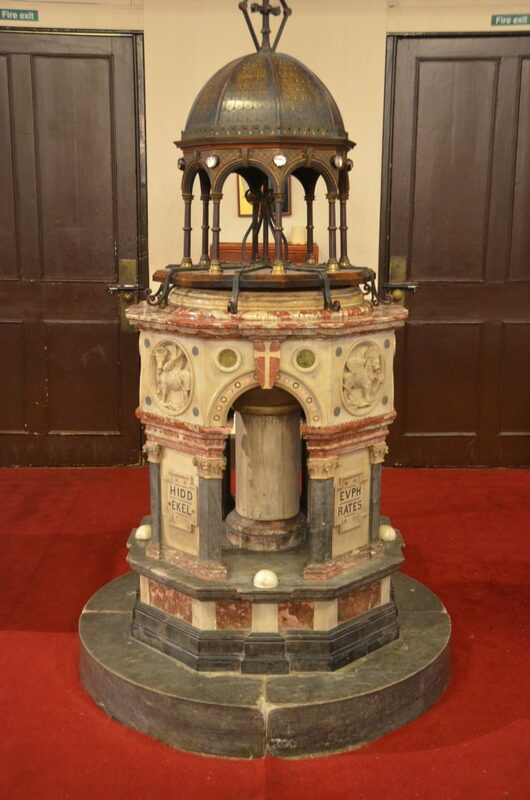 The Font is of marble, octagonal on a round base with eight colonnettes and four arched and four solid panels round a central drum. In the panels are the names of the four rivers of the Garden of Eden: Gihon, Hiddekel (Tigris), Euphrates and Pison. The top has a rim of red marble within which is a circular white moulding round the edge of the bowl. The cover is octagonal with a domed temple-like structure formed in iron with cabochon crystals in the spandrels of round arches, the brass dome has engraved scales and a cross finial. 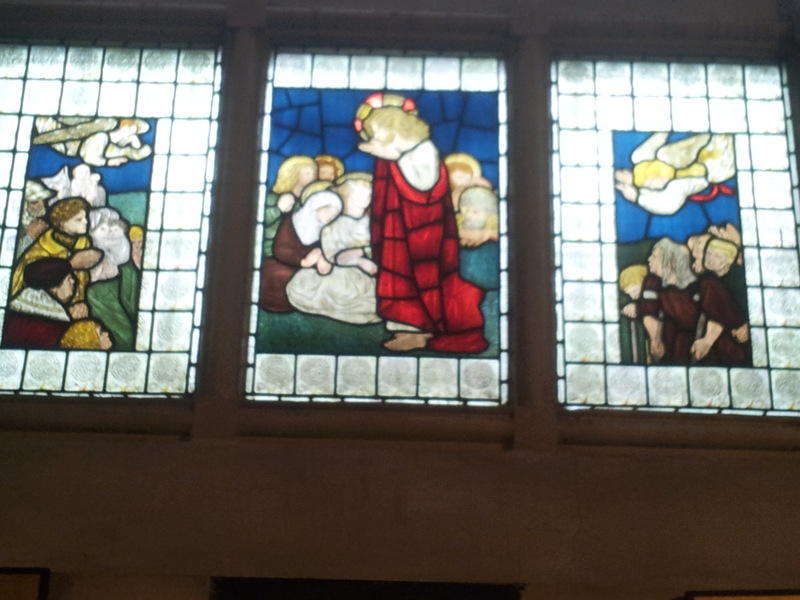 The stained glass windows include one from the design of Dante Gabriel Rossetti. It comprises three panels illustrating the Sermon on the Mount. The window was made in memory of Miss M. M. Polidori, who died 8th February, 1867. Rossetti’s mother’s name before her marriage was Frances Mary Lavinia Polidori.